This is the best form of mag to buy. The formulation is great and so is the price! Will buy again! High Absorption 100% Chelated Magnesium is great for sleep issues. Helps me move bowels more often as well. 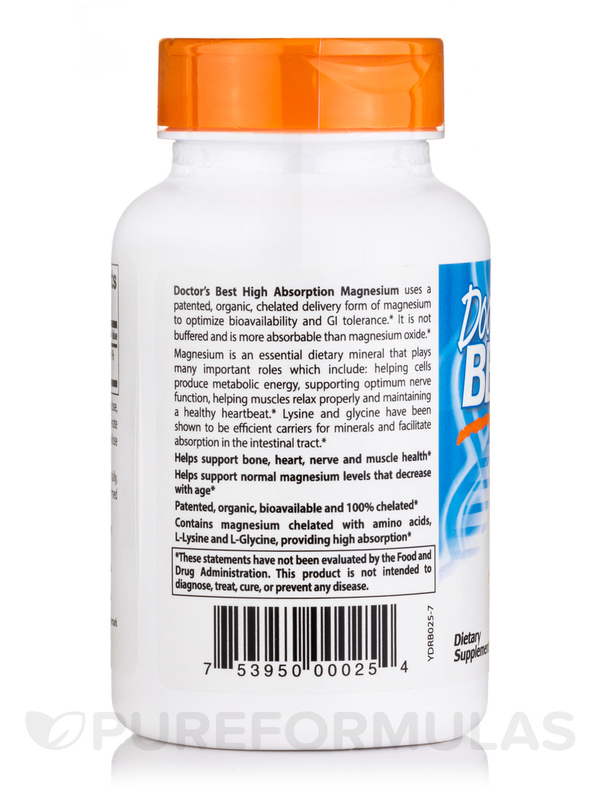 This High Absorption Magnesium by Doctor's Best is a very good item. I've been talking this for some years. 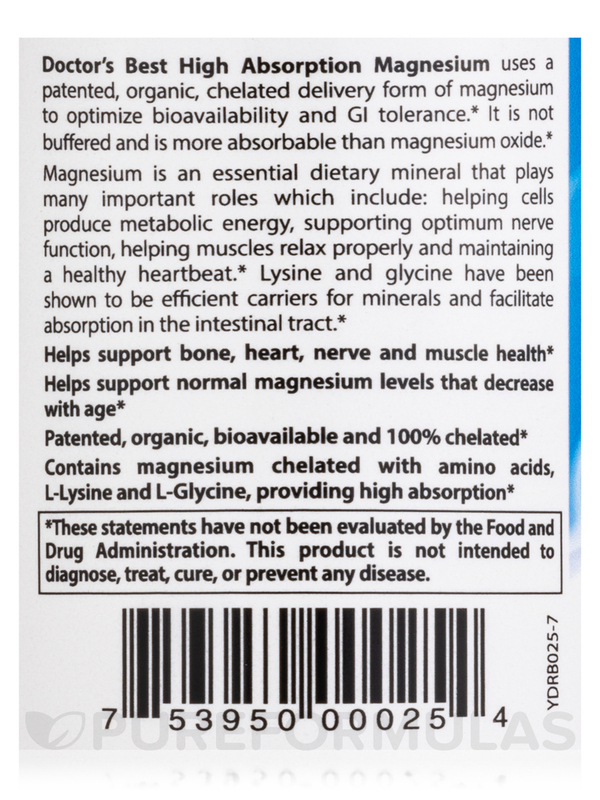 For science-based nutrition in a dietary supplement that supports the heart‚ nervous system‚ and cellular energy production‚ try Doctor’s Best’s High Absorption 100% Chelated Magnesium. 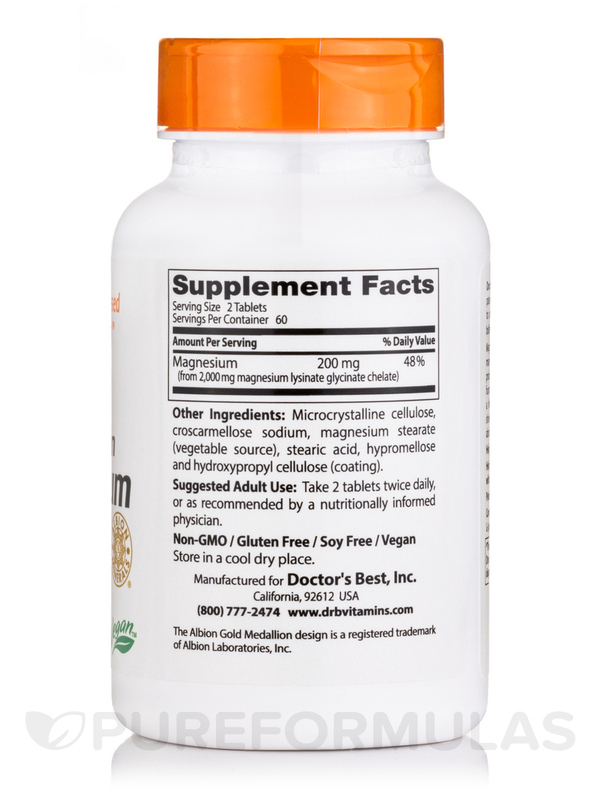 Each tablet provides elemental magnesium‚ which has been chelated with the amino acids glycine and lysine. As an essential mineral‚ magnesium plays many important roles. It helps cells produce metabolic energy‚ supports optimum nerve function and healthy bones‚ promotes muscle relaxation‚ and helps you maintain a healthy heartbeat. Glycine has been shown to be an efficient carrier for minerals by facilitating absorption in the intestinal tract. It’s used by the body to form collagen‚ a key protein in cartilage and connective tissue; this may ward off joint pain and stiffness. Meanwhile‚ lysine is an essential amino acid that assists gastric functioning. Magnesium acts a co-factor for metabolic enzymes. Perhaps most importantly‚ it works very closely with calcium to promote tooth and bone density. Weak bones can interfere with your everyday life by making you more susceptible to injuries caused by motion. Loss of magnesium during food processing and low magnesium content in common processed foods are factors in a lack of magnesium. In addition‚ absorption of the mineral tends to decrease with age. The elderly may be susceptible to magnesium deficiency for a variety of reasons‚ including inadequate intake‚ poor absorption due to impaired gastrointestinal function‚ and the use of drugs such as diuretics that deplete magnesium stores from the body. A lack of magnesium may cause the visible signs of aging to appear more quickly‚ due to its impact on the cardiovascular and nervous systems‚ as well as on muscles and the kidneys. Women who take both synthetic estrogen and calcium supplements may be at risk for low blood levels of magnesium. Estrogen promotes the transfer of magnesium from blood to soft tissues; low blood magnesium may result if the ratio of calcium to magnesium intake exceeds 4 to 1. Magnesium supplementation is thus advisable for women taking these supplements. Unfortunately‚ a low magnesium status may often not be recognized‚ and many people of all ages who could benefit from supplementation go without it. The average adult body contains anywhere from about 21 to 28 grams of magnesium. Approximately 60 percent of the body’s magnesium supply is stored in bone. Soft tissue‚ such as skeletal muscle‚ contains 38%‚ leaving only about 1–2% of the total body magnesium content in blood plasma and red blood cells. Magnesium works as a co-factor for over 300 enzymatic reactions in the body. Metabolism uses a phosphate-containing molecule called ATP as its energy source. Magnesium is required for all reactions involving ATP. ATP supplies the energy for physical activity by releasing energy stored in phosphate bonds. Skeletal and heart muscle use up large amounts of ATP. The energy for muscle contraction is released when one of ATP’s phosphate bonds is broken‚ in a reaction that produces ADP. Phosphate is added back to ADP‚ re-forming ATP. ATP also powers the cellular calcium pump‚ which allows muscle cells to relax. Because it participates in these ATP-controlled processes‚ magnesium is vitally important for muscle contraction and relaxation. By controlling the flow of sodium‚ potassium and calcium in and out of cells‚ magnesium regulates the function of nerves as well as muscles. The heart is the only muscle in the body that generates its own electrical impulses. Through its influence on the heart’s electrical conduction system‚ magnesium is essential for maintenance of a smooth‚ regular heartbeat. Magnesium may help your body cope with stress and increase the amount of antioxidants in your bloodstream. Magnesium intake is tied to skeletal bone health through several pathways. Under normal physiologic conditions‚ parathyroid hormone (PTH) secretion is low when magnesium intake is not adequate. Additionally‚ PTH resistance can develop. Adequate magnesium intake can support the normal function of PTH. Low magnesium intake is further associated with a disturbance in blood levels of the active metabolite of vitamin D‚ as well as an increase in cytokines‚ both of which may impact bone health. Numerous studies‚ large and small‚ have examined the relationship between magnesium and bone health. The dietary intakes of magnesium‚ potassium‚ fruits and vegetables are associated with increased bone density in the elderly. Research also suggests that magnesium may help support bone mineral density in women across the age spectrum. Mineral absorption occurs mainly in the small intestine. Like any mineral‚ magnesium may be absorbed as an ion‚ a mineral in its elemental state that carries an electric charge. Mineral ions cross the intestinal membrane either by simple diffusion or through active transport by a protein carrier embedded in the cells lining the membrane inner wall. The magnesium in mineral salts is absorbed in ionic form. However‚ absorption of ionic minerals can be compromised by any number of factors‚ including low solubility of the starting salt (which inhibits release of the mineral ion) and the binding of the released ion to naturally occurring dietary factors such as other minerals‚ phytates‚ and fats (which form indigestible mineral complexes). A second absorption mechanism has been discovered for minerals. Experiments have shown that minerals chemically bonded to amino acids (building blocks of protein) are absorbed differently from mineral ions. This has given rise to the introduction of "chelated" minerals as dietary supplements. Mineral amino acid chelates consist of a single atom of elemental mineral that is surrounded by two or more amino acid molecules in a stable‚ ring-like structure. Unlike mineral salts‚ which must be digested by stomach acid before the desired mineral portion can be released and absorbed‚ mineral chelates are not broken down in the stomach or intestines. Instead‚ chelates cross the intestinal wall intact‚ carrying the mineral tightly bound and hidden within the amino acid ring. The mineral is then released into the bloodstream for use by the body. In order for a mineral supplement to qualify as a genuine chelate‚ it must be carefully processed to ensure the mineral is chemically bonded to the amino acids in a stable molecule with the right characteristics. The magnesium glycinate/lysinate in High Absorption 100% Chelated Magnesium is a genuine dipeptide chelate. It has a molecular weight of 324 Daltons‚ considerably lower than the upper limit of 800 Daltons stated in the definition of "mineral amino acid chelates" adopted by the National Nutritional Foods Association (now known as the Natural Products Association) in 1996. Each bottle of High Absorption by Doctor’s Best contains 120 tablets. Other ingredients: Cellulose‚ croscarmellose sodium‚ stearic acid‚ magnesium stearate (vegetable source)‚ hypromellose. Take 2 tablets twice daily‚ with or without food. For occasional constipation, relief comes from High Absorption Magnesium by Doctor's Best and I also take it with calcium. In about half an hour after taking both with a full glass of water, your next destination is surely the restroom. Effective, I must say! This Doctor's Best is the BEST! Doctor's Best High Absorption Magnesium is definitely the best! I have problems with cramps in the lower legs occasionally and know when I need it. When taken regularly it never happens. Love it! I've tried several other brands of magnesium glycinate, but I always come back to the Doctor's Best brand. I wanted to like the more expensive ones, because they didn't have all the extra ingredients that Doctor's Best has. However, none of them worked as well, the others didn't bother my stomach but it was almost like I wasn't taking anything at all. I had severe pain in my hip and leg, I could barely walk without limping, I took 2 of the High Absorption Magnesium by Doctor's Best and the pain started to go within the hour. That is doesn't take days for it to start working. 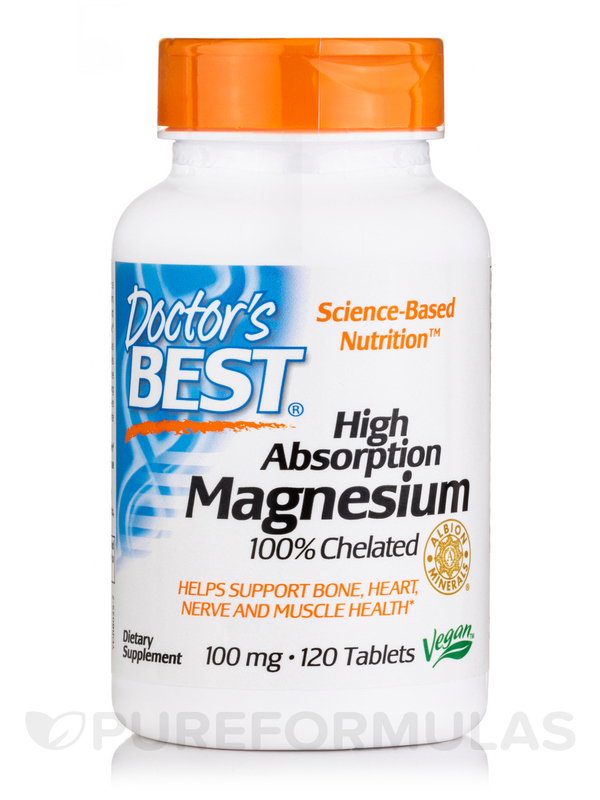 I use High Absorption Magnesium by Doctor's Best to help with absorption of calcium supplement. The trusted quality of Dr s Best brand. I have trouble falling asleep and staying asleep. I find that with High Absorption Magnesium 100% Chelated by Doctor's Best I fall asleep right away and should I wake up, I am able to easily fall asleep again. It works! Great results at an affordable price. I have always been happy with the prompt delivery from Pure Formulas. My son takes this High Absorption Magnesium (100% Chelated with TRAACS) by Doctor's Best with calcium and it helps him sleep. The pills are too big, I don't usually have a problem with pills but 100mg per pill I was almost gagging. I couldn't handle more than 4 pills at a time. Even with more than the recommended amount I still didn't feel anything, not at all "regular". Put these in a glass of water to see if they were dissolving and surely they did. Perhaps High Absorption 100% Chelated Magnesium by Doctor's Best formula doesn't agree with me. Helps me with anxiety, sleep and digestion. 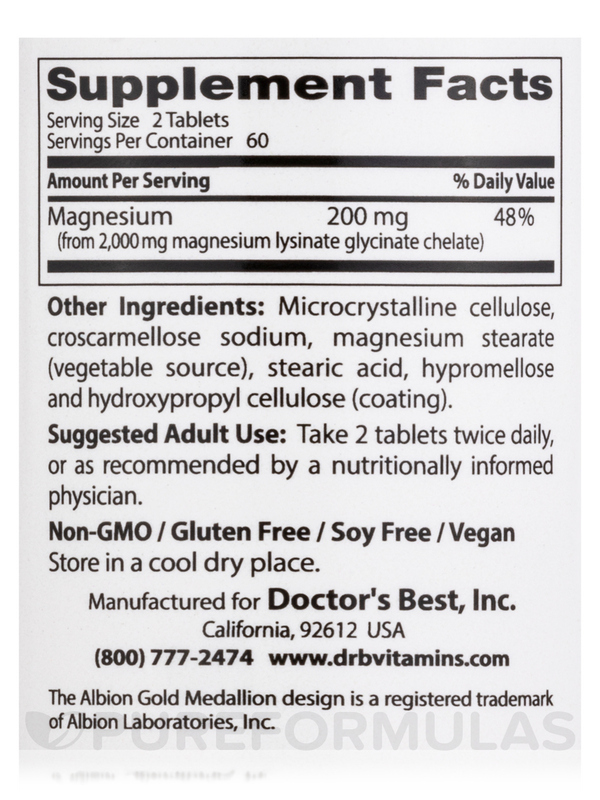 I had stomach issues and tried just about everything before High Absorption 100% Chelated Magnesium by Doctor's Best. Helped me almost immediately. It was hard to believe how well and quick it worked. I take one a day because two gave me the runs. Easy to use. Works fast and well. High Absorption 100% Chelated Magnesium by Doctor's Best work great because of high absorption rate. I really feel the difference in my sleep.